An increasing number of bank customers are aware of — and want to see more of — deposit automation terminals, a new RBR report reveals. 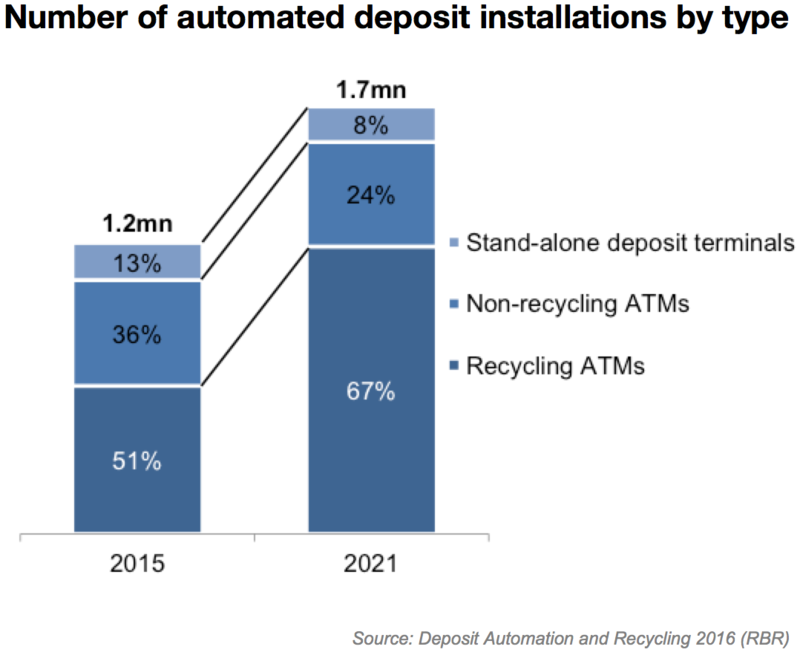 According to “Deposit Automation and Recycling 2016,” the number of deposit automation terminals worldwide rose 10 percent — to 1.2 million — in 2015, and banks cite customer demand as a major factor in the increase. The benefits of extended-hours access (90 percent of ADTs are available outside normal branch hours) and faster account crediting make automated deposit terminals especially popular with consumers. For banks, a major attraction is the ability to reduce costs by shifting more transactions from the teller counter to self-service. The majority of ADTs are deposit-accepting ATMs; many banks are taking this a step further, installing recycling ATMs that redispense deposited notes. Additionally, one third of ADTs are located off-premises; many banks are replacing these machines with recycling ATMs to reduce the cost and inconvenience of CIT delivery, the report reveals. RBR forecasts automated deposit will be available at 1.7 million terminals worldwide by the end of 2021. Recyclers will gain share in most markets, while the number of stand-alone deposit terminals will decline.